By using our website, you agree to be bound by LEDS4LESS Terms & Conditions, as stated below. The display of goods on the LEDS4LESS site amounts to an invitation to treat only and is not an offer to sell products or services at any price indicated. No contract for the supply of products or goods will be deemed to exist between you and LEDS4LESS unless, and until, an email is sent by and LEDS4LESS to you confirming that your order has been accepted and payment has been successfully made. This confirmation e-mail amounts to an acceptance by and LEDS4LESS of your offer to buy goods or services from and LEDS4LESS and this acceptance is effective regardless of whether or not you receive the e-mail. LEDS4LESS are free to withdraw from a prospective contract at any time prior to acceptance. This also applies in the case of any error or inaccuracy in respect of the goods or services, any description applied to the goods or services, the availability of the goods or services, or the order itself. LEDS4LESS is providing this site and its contents on an "as is" basis and makes no representations or warranties of any kind with respect to this site or its contents. LEDS4LESS disclaims all such representations and warranties, including for example warranties of merchantability and fitness for a particular purpose. In addition, LEDS4LESS does not represent or warrant that the information accessible via this site is accurate, complete or current. Except as specifically stated on this site, neither LEDS4LESS nor any of its directors, employees or other representatives will be liable for damages arising out of or in connection with the use of this site. This is a comprehensive limitation of liability that applies to all damages of any kind, including (without limitation) compensatory, direct, indirect or consequential damages, loss of data, income or profit, loss of or damage to property and claims of third parties. LEDS4LESS shall not be under any liability for current or future damage, losses (whether direct, indirect or consequential), expenses, loss of contracts, liabilities, injuries, loss of profits, business or economic loss, depletion of goodwill, costs (including legal costs), claims, demands, proceedings, judgments or otherwise resulting from the failure of products, late/loss or incorrect deliveries or inadequate given advice or information of the company LEDS4LESS or that of its employees. Losses, damages and liability are limited to the company only and not any of its directors or employees. LEDS4LESS reserves the right to modify these terms at any time without prior notice. Any modification of these terms will be deemed to be effective from the date and time of posting on the LEDS4LESS web site. The Company reserves the right to refuse to accept any cancellation of an order unless notification in writing is given to the Company before the order has been dispatached and accepted in writing by the Company. In the event of any cancellation the Buyer must pay expenses incurred by the Company. If you are not completely satisfied with your purchase, simply return the item to us in its original condition within 14 days of receipt. Returned items should be unused and must be returned in original packaging with any enclosed documentation. We will issue a full refund on receipt, excluding the original delivery charge. If the items original manufacturers packaging or box is damaged a £3 restocking fee will apply. 1. If you are returning an item you must contact us by email before sending, (info@leds4less.co.uk) we will provide you with a returns form via email to enable processing. 2. Goods will only be accepted for return if they are despatched within 14 days of delivery, unless we have notified you otherwise. 4. The cost of returning the item to us is your responsibility and not refundable. 5. Our technical team will carry out initial testing to confirm any faults. 6. Delivery charges are only refundable where goods are confirmed faulty and a refund is made. The maximum postage refunded for faulty items is £2.60 unless a higher amount is confirmed in writing by us. 7. We do not offer an exchange service, if you would like a new or replacement item please place a new order. 8. Customers must return goods for a refund and retain proof of postage as this will be asked for if the item does not reach us. All clearence items are covered by a 6 month Warranty against faults and defects occuring in this period. The 6 month period starts on the day of purchase. Any items that are sent back and found to be faulty are eligible for a refund. Any products sold on the www.leds4less.co.uk website that develop a fault or are suspected to be faulty within a 6 month period from the date of purchase can be returned to us for a full refund inline with the terms and conditions of our returns policy. We do not accept any items after this 6 month period unless otherwise stated. If a warranty is given by the manufacter for a particular good then the manufacturer should be contacted directly regarding any warranty details. 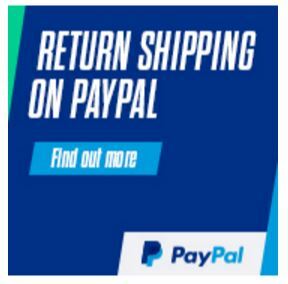 We aim to dispatch all items ordered within one working day once payment has been received. For next day delivery any items must be ordered before 14:00pm to ensure deliver is dispatched the same day.